I enjoy reading the fictional works by Jane Austen as well as fiction and nonfiction about Jane Austen, so I was intrigued when I received an ARC of Blood Persuasion by Janet Mullany. 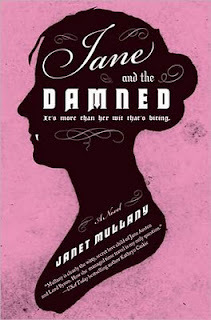 Of course since that is the second book in the "Immortal Jane Austen" series by this author I purchased and read the first in this series Jane and the Damned. I had previously read and enjoyed the "Jane Fairfax" series by Michael Thomas Ford, but that series was set in modern times and Ms. Mullany's series is set during the lifetime of Jane Austen . . . big difference. Jane begins to live a double life, one where she mingles with the vampires at night and the other where she tries to be the genteel daughter and sister her family expects. When the French invade Bath, Jane and the other vampires fight alongside the English to overthrow the French. Of course the English prevail, but Jane has become enamored with her new vampire master. She loves her family and finds it difficult to decide whether or not she should stay a vampire or take the cure. Will she take the cure, return home with her family and writing or will she stay a vampire with her new love? Again, I found the premise of Jane Austen as a vampire rather interesting. However, Jane and the Damned seemed to stretch credulity. Yes I know this is fiction but even paranormal-fantasy and science fiction make a certain amount of sense. The romance between Jane and her new master is the only part that made sense and rang true. The remainder of the story just didn't do it for me.